It's not just a dose of jokes. 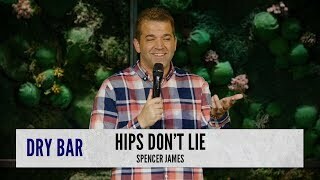 It's Martin and Lewis, with a little dash of Sinatra and Sammy Davis Jr.
Spencer James blends both music and dance into his stand-up for a show that's both anti "jobs" and yet pro "fat kids." Mixing in an a capella voice with a sharp tongue, Spencer has entertained audiences all over the country, from fishermen in Dutch Harbor, AK, made famous by the hit TV show "Deadliest Catch," to our troops in Hawaii while laying on the sand for the very first episode of "Lost." While being sensitive to a lady's needs, he also somehow winds up saying the most insensitive thing at the worst possible moment. His reasoning for this? Who knows, guess you'll find out at the show. view more..
Who knows, guess you'll find out at the show.